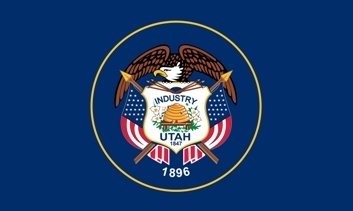 The dark blue field of the State Flag official Utah is illuminated by a gold circle that encompasses and image of the state seal. The seal features a picture of the beehive, the symbol of industry and cooperation. The Utah flag serves as a symbol of honor, heritage and regional pride and is displayed at state buildings. There is an Order of Precedence for flags. State Flags are displayed in order as they entered the Union. Car Flags are often displayed to represent of an individual's allegiance to their state. Utah State car flags are used by their owners as mobile emblems of their home. Car flags are usually made from strong materials and are attached to a car via a pole and clip window attachment. What is the design of the Utah state flag? What do the dates symbolize? What does the beehive symbolize? The beehive is a symbol of industry and cooperation that dates back to the Roman era. The beehive was adopted as a symbol of the Church of Jesus Christ of Latter-day Saints, or Mormons, who are well established in Utah. What do the arrows symbolize? Who designed the Utah Flag? The name of the designer is unknown but it was originally designed for the USS Utah, dreadnought battleship in 1912. What is the history of the Utah Flag? 1922: The error originated in 1922 when a flag maker misplaced the year 1847, by stitching it just above the year 1896, instead of in its correct position on the shield. 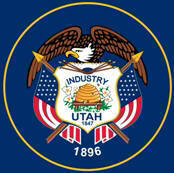 The Utah flag is kept and used as required by the code specified in the constitution of the state. Official Utah Nickname "Beehive State"